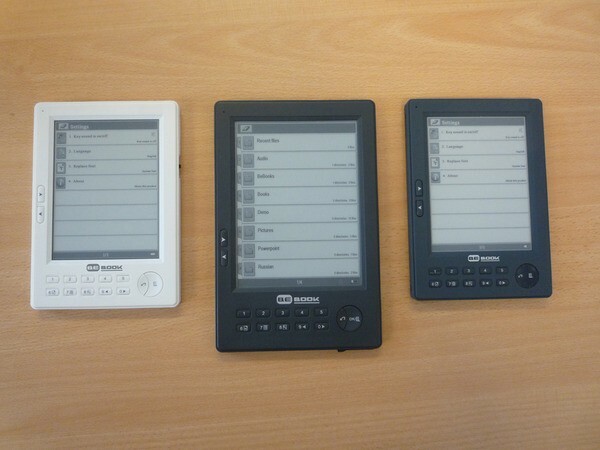 Endless Ideas have published images of the upcoming Bebook Mini, which packs in all the features of the original Bebook into a smaller format. It looks like it will have SD card support and should be staying under the $200 / €200 price barrier. There’s no indication of a release date, but BeBook Twitter feed did tease about staying under the $200 / €200 price barrier. Until then, make sure you check out the excellent Bebook here. We have recently received our copy of the BeBook ebook reader, and we have been pretty impressed so far. The Dutch based BeBook has some stiff competition in the UK, especially from the new Sony Ebook reader which is currently available from Waterstones for only £224 here. 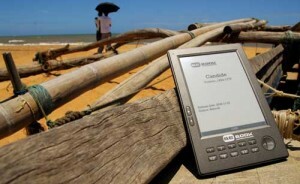 So whats so great about the BeBook ereader? Well, from the outset, the device looks quite good, its much better looking than the Amazon Kindle, and has an impressive battery life of around 7,000 page turns, a 6 inch reflective screen mimicking paper, and a light weight of around 220g with its battery. At the moment, BeBook are offering 150 classic books free, which come preloaded at purchase. You can then download any book listed on the MyBeBook.com website free of charge, which currently has over 20,000 classic titles available! 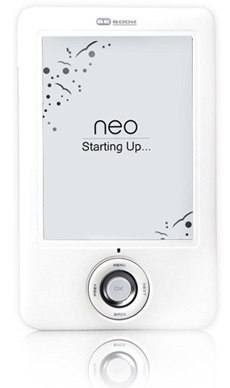 In terms of anti-piracy, BeBook says that each device has a unique key, which can be used to identify any copyright-infringing users that are using illegally obtained ebooks from torrent and usenet sites. I’m not too sure how this can work, but it sounds like a way of protecting themselves from a potential onslaught of legal cases, whether this feature really works or not. 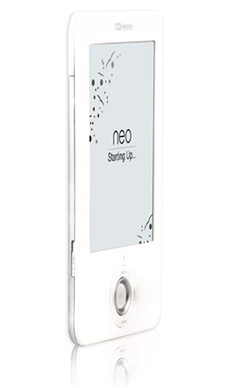 Similar to the other leading e-ink readers on the market, it’s also easy to read in direct sunlight, but as the device is not backlit, you will need a reading light for night reading. The BeBook also comes with a great RSS which can update aall of your favourite news feeds from your PC first thing in a morning and you can browse the news on the way to work. This beats having to go though the Metro or a broadsheet at 8am in a crowded underground. This is a real plus point that the BeBook has over Sony’s Reader, which can’t currently handle RSS feeds. 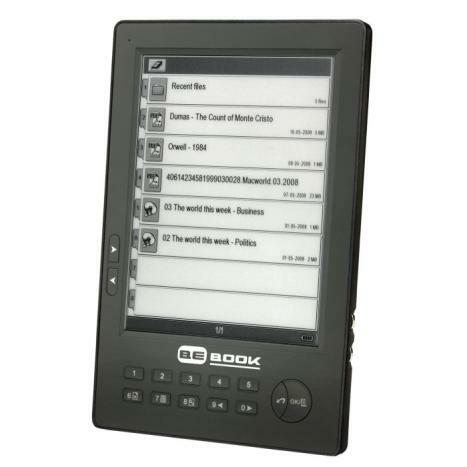 Also as of August the BeBook supports the Mobipocket DRMformat, one of the most prolific e- book publisher formats in the world, so it promises to have plenty of titles available for it. Pricewise, The BeBook is retailing for £199, which is £25 cheaper than the £224 Sony Ebook reader, and comes with a large library of free ebooks so will come out cheaper in the long term. Bebook have kindly provided us with a discount code which enables you to save €25 off your purchase, click here to get your BeBook for only £180 by quoting our voucher code: [email protected] at checkout. 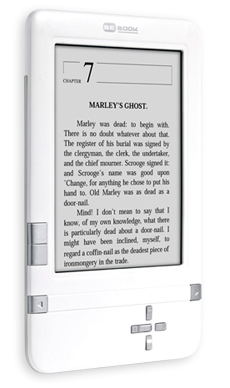 Some people might prefer the Sony Ebook reader because it’s a Sony product, but if you are keen on reading your rss feeds in the morning, and like to read your own pdf and txt ebooks, this is a great choice – Plus it comes with over 20,000 free ebooks to download from the BeBook library. So don’t delay, get one in time for Christmas! You can find the BeBook here. And don’t forget to use our voucher code “[email protected]” to save €25 / £25. Edit: The video was taken before August when the device didn’t have the Mobi Pocket format compatibility. Also as of August the BeBook supports the Mobipocket DRM format, one of the most prolific e- book publisher formats in the world, so it now has plenty of modern titles available for it.